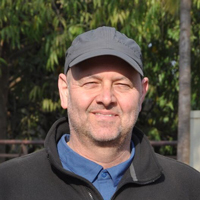 Wildfoot Travel’s Simon Rowland took a trip to India recently, exploring wildlife parks and other areas of interest to make sure we give our clients the best possible advice and put together the most rewarding wildlife adventures in this beautifully compelling and endearing country. 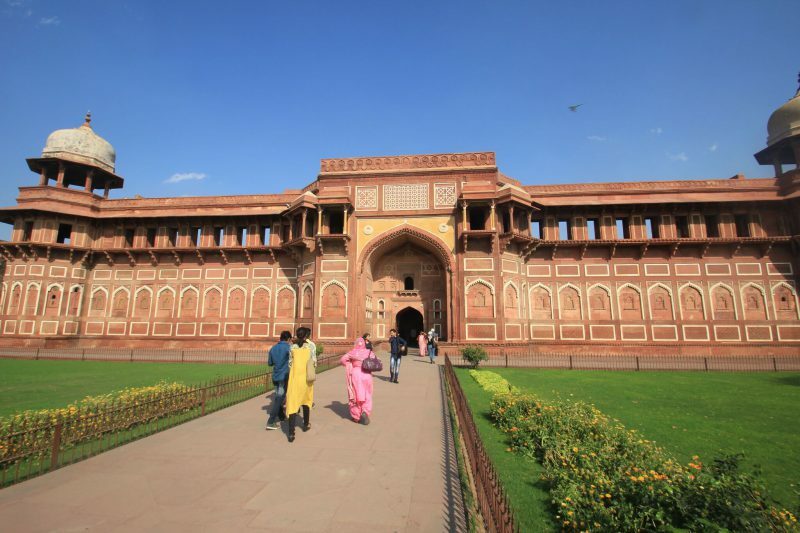 Here is his day-by-day account of the trip which provides useful insight and inspiration for those considering a visit to India. Sasan Gir National Park & Sanctuary. My flight to Delhi takes around 8 hours from London. I check in to an airport hotel on arrival to sleep for a few hours before my domestic flight to Ahamedbad. 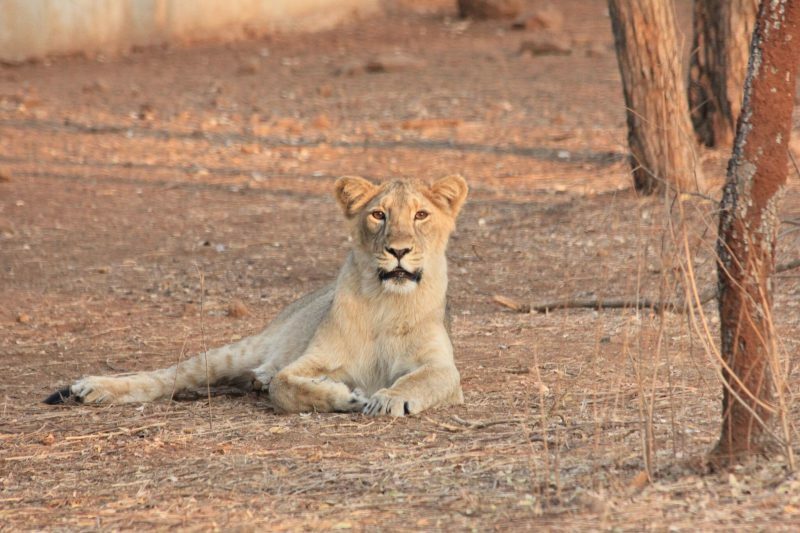 Gir National Park is the only Indian habitat of the Asiatic Lion. Located in the South west of the Saurzshtra Peninsula, in North West India’s State of Gujarat. We arrived last night after a flight to Ahmedadab from Dehli for just over an hour and then a seven hour drive to the region and safari camp. There are easier ways of doing this via Bombay with a short domestic flight and then a three hour transfer via road. We are staying at the Lion Safari Camp, a mid range tented accommodation of around 20 twin or double suites all with WC and shower. The accommodations share a reception and restaurant area. Lion Safari Camp is located next to a river which offer wonderful opera unities to observe water birds and crocodile. WILDFOOT Travel will shortly be featuring Gir as part of our India wildlife and birding programme which will be unique. We set out at 5am for our permits today to the close-by reception centre. Every safari starts here and unfortunately your guide has to go through the same rigmarole every time you go out on safari which seems excessively red-taped. But our Wildfoot guide will assist and do most of the leg work which means a 6.30am start rather than 5.00am. Our experienced guide Jitendra speaks excellent English and is a dedicated and knowledgeable birder as well as a general wildlife naturalist. He comes with a professional driver and an ‘Suzuki Gypsy’ jeep. The jeeps open rear allows us to spot a tiny Rare bird at 30 metres in camouflage undergrowth before the sun rises – making it an absolutely amazing day for me. Most of those who come to this region are in search of the Asiatic Lion and the fantastic birding opportunities the Gir National Park offers. The park is only open from December to June and closes during the Monsoon weather period as travel within the park would be impossible in a jeep. Within 30 minutes of entering the park we see a young lioness walking away from us. Not the best of sightings, but exciting none the less. Monitoring her are allocated national park guides, swapping shifts around the clock. Each lion or pride is carefully watched and guarded to ensure their welfare and safety. The state is extremely protective of these creatures. There are only 530 of these lions remaining including 210 females, so their ongoing safety is critical to their survival. We were signaled by the lion guide to approach quietly and take good view of her from around 50 yards away. The morning was hugely inspiring for us as we enjoyed three more lion sightings and saw a wide array of other wildlife including spotted dear, blackbuck, grey langur monkey, Indian palm squirrel plus over 30 species of bird sightings including woodpecker, purple sunbirds, a large green barbet, a red-vented bulbul, a rose-ringed parakeet, an Indian nightjar, a grey wagtail, a golden backed woodpecker and an impressively camouflaged collared scoops owl peering down from its nest hole approximately 4 metres off the ground. 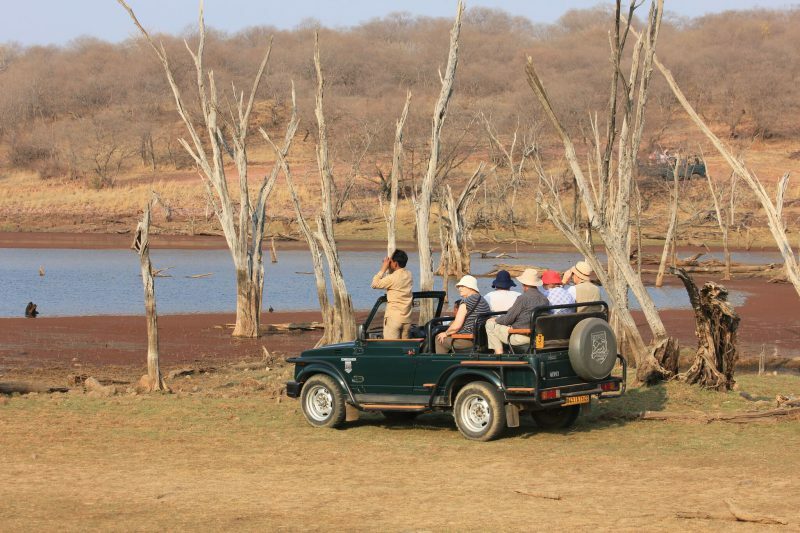 As the safari came to an end, at around 9.30am, our guide took us for a stroll by the river, outside Lion Safari Camp. The midday heat was becoming too much to bear but we enjoyed ticking off of a huge list of water birds and other species who were relishing the shelter of the reads along either river bank. These included a little green bee eater, several pies kingfishers, a black winged stilt, many red wattled lapwings, and a black ibis. 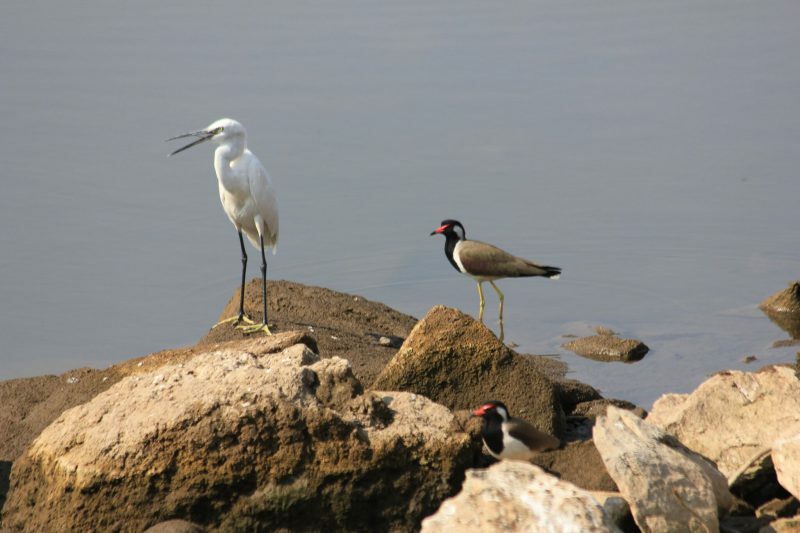 The birdlife in Gir National Park & Sanctuary is second to none. Gir National Park, Gujarat State. This afternoon could not have been a better follow on from the morning’s wildfest, we observed white spotted fantail, Indian nightjar (same one as this morning) tickles flycatcher, blossom headed parakeet, crested serpent eagle, cattle egret plus twenty or so other species. There are seven routes in the Gir National Park, all very different. The thirty or more jeeps which leave for every safari are split in to differing routes to keep the congestion to a minimum. 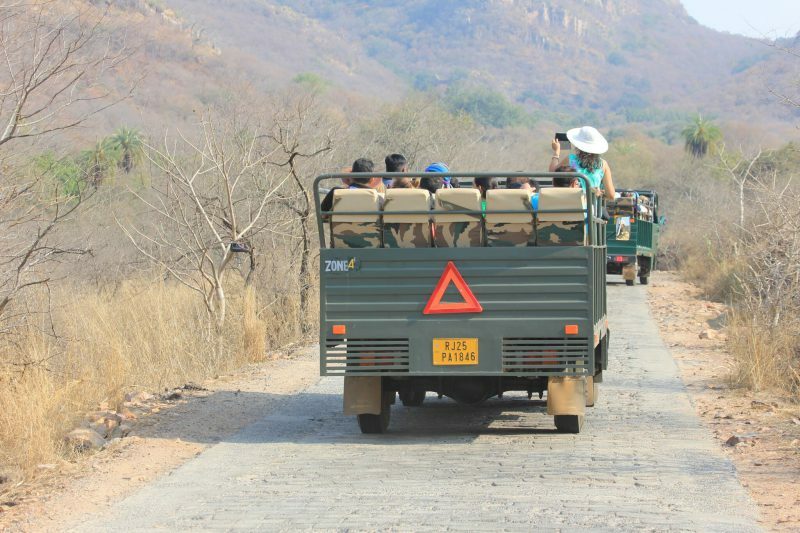 Wildfoot Travel always aim to stay at the back of the group of jeep, enjoying peace and tranquility with no vehicles behind and allowing unhindered observation of the surrounding wildlife. As the sun lowered we were treated to the best sighting yet. A mother with two eight-month old juveniles at one of the many manmade watering holes in the park. After a short ‘wet’ they settled down in the last of the warm lingering sunshine whilst we took all the snaps we needed. The low, warm light seemed made for a near perfect photo-opportunity and lent a certain authentic character to our shots. Shots that we will all treasure log into the future. The Asiatic Lion used to exist in south west and north Asia, eastern Europe and the middle east. By the 19th century it had been eradicated from Turkey. In 1944 the last corpse of a lion was found on the bank of the River Karun in Iran. In 1963 the last Persian pride were ruthlessly hunted and killed in Iran. At the time the local press praised the hunt as a great success, which seems absolutely shocking today, knowing the Asiatic Lion is now endangered and only survives in Gir National Park. You will be pleased to know they are flourishing today, along with the Indian Leopard, due to the major understanding of the government with influences from a handful of conservationists who have been fighting exceptionally hard for this day, even with their near loss of life in some cases. We leave this park and region with huge respect for the hardworking, highly experienced guides and rangers of the region. We’ve come to know the guides well over the last couple of days and their sincere love of the region and its wildlife, not to mention birding, is highly evident. Wildfoot Travel will be featuring Gir National Park in our Indian wildlife and birding itineraries. After this experience, how could we possibly miss it out? Travelling to Bera Village in south west Rajestahn in search of Indian Leopards. Bera conservation area. Seven hours drive to Ahamanbad, an overnight stay followed by a further five hours to Bera in the south of the state of Rajestahn. Today’s first safari proved extremely promising with sightings of a leopard mother and her two small cubs from round 5 to 7 pm. Although they were at a distance, we could see them quite clearly. First the mother on the light brown granite stone and grass hillock moving at a slow pace over an hour, camouflaged in some cases by the various shrubs, other times completely in the open. Then, suddenly seeing two cubs next to her, we understood where she had been carefully heading and certainly trying not to alert anything or anyone to her precious off spring some 400 metres away on the hillock. We shared a very special experience as we watched them play, run and frolic from a distance with the mother looking over towards us on occasions as if to keep a real eye on us. Dusk brought a gentle end to the spectacular natural theatre. The next morning we head out on safari early at 5.30am to establish where the leopard family have moved to during the night. Initially we drove to a totally different area hoping to see a large leopard male. We were comptely hooked and just couldn’t wait to see more leopard action, perhaps in a different part of the National Park. Whilst in the village of Bera we are staying at a unique heritage home stay type accommodation called Bera castle. It offers a distinct style of visit with authentic surroundings in the rooms and communal areas. The dining room walls play host to fascinating antique images of the owner’s family history and that of their rulers who they were closely connected with. 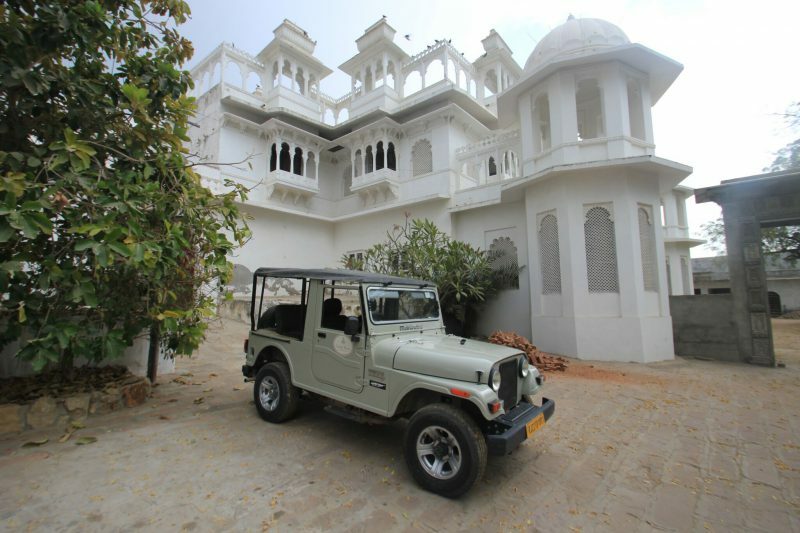 Bera Castle was built in the late 1800’s and is still owned by two brothers of the same family one of which is Mr Baljeet Singh, a champion of wildlife conservation and wildlife and birding enthusiast. Whilst the guest house is not everyone’s cup of tea, it offers overseas guests a true opportunity to experience life in a typical Rajistahn country village. A vilage which seems to be frozen in time. In between the leopard safaris, one early in the morning and one late afternoon Accompanied by Fatarrm, a friendly guide from the guest house, we enjoyed several walks in and around the village. The village is rarely visited by outsiders because most who visitors to Bera are in search of the rich but sometimes allusive wildlife – Leopards are the main act but hyenas, birds, wolves play minor but important roles too. The outskirts of the village are treated to another kind of visitor (or I should say predator) during the early hours of the morning. You probably know where this is heading and which to outsiders may seem a little like a Jungle Book scenario. One thing you learn quickly about India, is to accept and embrace every day occurrences without too much questioning – maybe a few questions otherwise there’s no fun comparing with what we know as normal. You have probably guessed it. The leopard was the visitor, making the most of local cattle and even village dogs on a regular basis. Those who lose cattle in this way are nominally compensated by the government for their loss. We do know its not the only item on the menu that attracts the leopards as they have a taste for monkey, peacock and other easy pickings from the local wildlife. 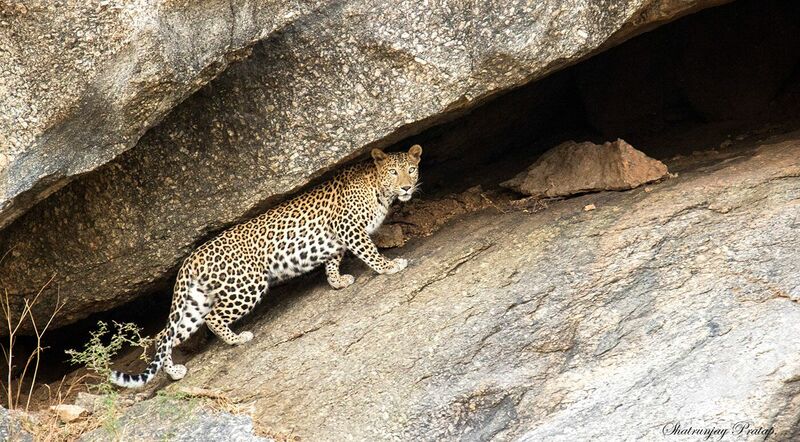 Leopards in Bera Region are a literally breathtaking sight. Villagers seem to co exist with what helps to drive the local village economy, but as more adventurous wildlife enthusiasts start to find out about the rich offerings at Bera, maybe it will assist in the creation of a new National Park, giving total protection which I can’t help feeling needs to be thought about and planed carefully. The protection of this unique area is essential and i just hope those local and national conservation crusaders don’t leave it too much longer. There are plans to build hotels on the outskirts of the village which will surely be the catalyst for immense social change. Those visiting cannot miss the village life experience which, right now is both totally authentic and a ‘must’ in my opinion before the an inevitable change starts to take its toll. Some good news is a piece of land which has been successfully rescued from the clutches of a surface mining company. The mining company in question were previously ‘assisted’ by a corrupt government official who is now resting behind bars contemplating a lengthy sentence. I decide to pay the site a visit. It is a rural ‘camp’ which has been just completed and opened for those in search of wildlife encounters. This includes the leopard of course but also hyenas, wolves at certain times of the year and also birding. The birdlife is particularly rich and varied in this area with several endemic species to be observed. The accommodation is tasteful, low rise and within total keeping of the surrounding area. There are five twin and double bungalows build within a spacious location and a stone’s throw to epic recent sightings. The couple behind this eco project are Shatrunjay and Katyayani Singh who are thankfully also wildlife conservationists and two more worthy champions of the local wildlife. As well as having his sights on leaving a legacy of wildlife protection, Shatrunjay and Katyayani are committed to encouraging ‘self’ sufficiency for local goat farms and to creating a gastro-cheese making initiative which can hopefully be introduced by local farmers offering support and knowhow. Although growing grapes is not an option in this region for climatic reasons. Shatrunjay, is an acomplished photographer working for National Geographic and an expert in wildlife and bird guiding. he knows the regions exceptionally well and has an impressive great command of the English language. The daily scheduled is unique as Shatrunjay not only offers twice-daily safaris to view the leopard, but he also takes the small group of guests on birding walks after breakfast in the scrub, looking for endemic species plus animal activity and movement on foot. The accommodation is the best quality around, offering a bungalow twin and double room come large lounge with two shower rooms. Well-appointed and tastefully done. We continue to be reminded that north west India offers incredibly rich and diverse Birding and wildlife. We stop on route to see bar headed geese, demoiselle crane and black buck which are an endemic breed and only found in certain parts of Rajistahn. 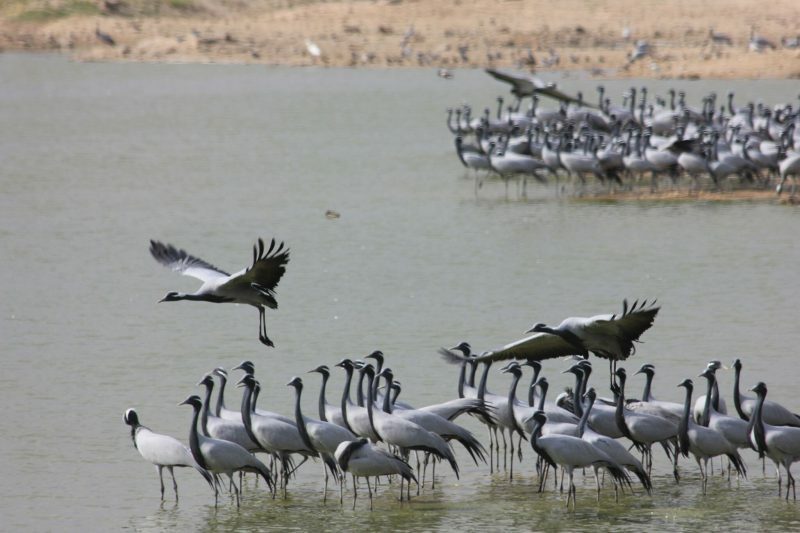 The demoiselle cranes are smaller than the common crane with a height of 90cm compared to a huge 120cm with the other species. Demoiselles are migratory visitors to India and enjoy the north west region particularly for the arid and stoney habitats. We discovered a group of around 500 on a man made wetland area 40 minutes outside Jodhpur. The black buck are very timid creatures but manage to creep to around 100 metres before they become jittery. There are around 12 in total including 4 males. I know little about this endemic species but tomorrow night I’m lucky enough to be visiting Mr Harsh Vardhan who had tremendous influence on Indian birding and wildlife conservation movement in the 1970s. His advice to the government had a major influence on the creation of the original National Parks including Rathanbore. Harsh is thought of very positively in conservation circles and his name has come up everywhere we have travelled so far. I’m looking forward to meeting him, especially as he is the father of my travelling companion and Wildfoot Travel’s wildlife specialist partner in India, Manoj Vardhan. On the train we were inquisitive about the food the two ladies in front of us were eating. They insisted we share somewith them. Shivi (meaning wife of the snake god in Hindi) Rathi, an industrial and engineering student from Jodhpur travelling with her professor and mother Rashmi Rathi. This demonstrated the exceptional kindness of the Indian people, which is especially evident on Indian trains. We agree to be sure to offer them a cup on chai when the chai walla comes through the carriage. Avoid cruelty to living beings. Green trees not to be felled. No meat to be consumed. Clean firewood before you burn so you don’t kill insects. This Hindi sect were the first known conservationists and in fact have given their lives to protect green trees, having made several sacrifices throughout the centuries including in a small village in Rajistahn where in 1604 two ladies chopped off their heads as a protect to the felling of Khejri trees. It is still remembered to this day by the Bishnoi and a main inspiration of the movement. Similar brave sacrifices occurred in the years that followed, including a 1730 major protest against the felling of trees to build a fort in Rajistahn where men women and children hugged the trees as axes fell and one can only imagine the blood of brave souls spilled from over 84 Bishnoi Villages. By that time 363 Bishnoi lives were spent. Harsh tells me how he follows some of the 29 rules of the Boshnoi and holds similar conservation principles dear to his heart. Harsh carried out extensive research for a recent thesis and studied this movement for many years. He’s now working on a the next book centred around the religious principles of the Boshnoi people. Watch this space. After an overnight visit to Agra to see the Taj and the Red Fort, l traveled by road to Bharatpur where I boarded the train to Ranthambhore. Around 1.5 hours from Agra is The Keoladeo Ghana National Park which attracts a huge amount of UK and worldwide birders every year. We stopped off first thing in the morning to meet birding guides who on the whole spoke very good English. If you are a keen birder this place is an absolute must for two or even three days. The Park is open all year round including Monsoon times. The peak breading period is August to October and for migrant birds October to late February. Unfortunately, the last sighting of this species in India was in the winter of 2002. The migratory paths for this species was included Afghanistan where it is thought these birds will have been hunted. But as well as that Keoladeo Park has experienced terrible droughts in recent years and may have also been a factor in the birds failure to return here. On a positive note you will find around 350 species of birds in the Keolandeo park and if you are a keen birder Wildfoot Travel recommends at least a two night stay here because there is simply so much to see. There are many routes within the park including boat trips around the shallow lakes which takes up over a third of the total 27 sq kms of the park. The park is open 6am to 6 pm and is very easy to hire an experienced and enthusiastic guide at the entrance of the park, which of course Wildfoot can pre-arrange for you. For good 3.5 star accommodation in the area the Leximi Villas Hotel is an ideal choice and very close to the park. The hotel is part heritage property and part new-build but made to look similar in every way as the original. The property was once a Haveli a kind of local manor house where heads or the village or area use to call home in years gone by. Some of these turn to ruin because of a lack of funding and repair but some are turned in to small and quirky guest houses or hotels by enterprising later generations especially if you have an important National Park on your doorstep. The train to Ranthambore takes five hours, with the luxury of conditioned seats or beds recommended, if travelling overnight are. Personally, I really enjoyed the train journeys in India. Each one is a real social occasion with an opportunity to meet diverse Indian personalities, share food and discussion if language allows. On several occasions passengers wanted to share whatever local delicacy they were enjoying with us. The Tiger centre of India and world renown as a place to observe the tiger in its natural habitat. Ranthambhore National Park is only four hours away from Agra and about the same from Delhi, so why would you miss this wonderful region out of your itinerary plans for India? We are collected by A family from of Manoj called Imrage who he and his father have known for many years. It is only ten minutes ride from the station to our camp hotel called The Tiger Den. This is a good 3.5 star in quality but the location is peaceful and far enough out of the town to be a haven for good birding opportunities around the property. There is a pool, large attractive lawns and beautiful rose gardens. The staff are very helpful and welcoming and Patrick the hotel manager is amusing, friendly and runs a very tight ship indeed. The food is excellent and a buffet style for all meals and offers flexibility and a wide choice. The wildlife offerings are equally diverse. Most visitors arrive in the hope of a glimpse of a tiger but it would be a lost opportunity to not embrace the other rich wildlife and reptile opportunities including leopards, sloth-bear, hyenas, wolves, mongoose, porcupine, spotted deer, samba deer, lungur monkey, wild boar and crocodile, not to mention various species of snake and lizard which are very hard to find most of the time but we are assured are there in any case. Bird species number up to 230 in total so it’s an absolute must for those who are keen birders. Wildfoot recommend at least three to four nights in Rathambhore. I took five jeep safaris over the three full days whilst we were there and enjoyed seeing Tigers on two occasions. One of these very close, within thirty metres, so provided and excellent photo opportunity. I have to say the wildlife in between tiger sightings for me and no doubt for others who enjoy wildlife in general has been riveting. I was slightly disappointed not to enjoy a personal sighting of the sloth-bear but many others I spoke to did experience many sightings. I guess you can’t expect everything! This area covers approximately 400 sq kms and offers currently 10 different safari routes. The forestry commission protects the area and one of their responsibilities is to ensure routes take equal amount of safaris, using six-person jeeps and larger vehicles called canters which carry around tweny-four people. Whilst a more affordable option, a canter caters for a larger group, making the eternise less intimate and the photo opportunities complicated. Wildfoot recommends you take a jeep option over the canter options in every case. The jeep costs more but the good opportunities for wildlife observations and photos increase by about thirty to forty to percent because in a canter you are stretching over a row of people every time you have an encounter. Wildfoot Travel can pre-book these safaris for you. So, whatever you do, don’t for expect to be able turn up and book on the day. Always plan way in advance. Due to the success of the immense Tiger protection over the last few years and vertically zero poaching, as of 2016, there are close to 65 tigers (grown from just 26 from 2007) in the current 400 sq kms of national park. It sounds like a large enough space but large territories are tigers fight aggressively over by their territory and therefore that has to be planned ahead ideally. 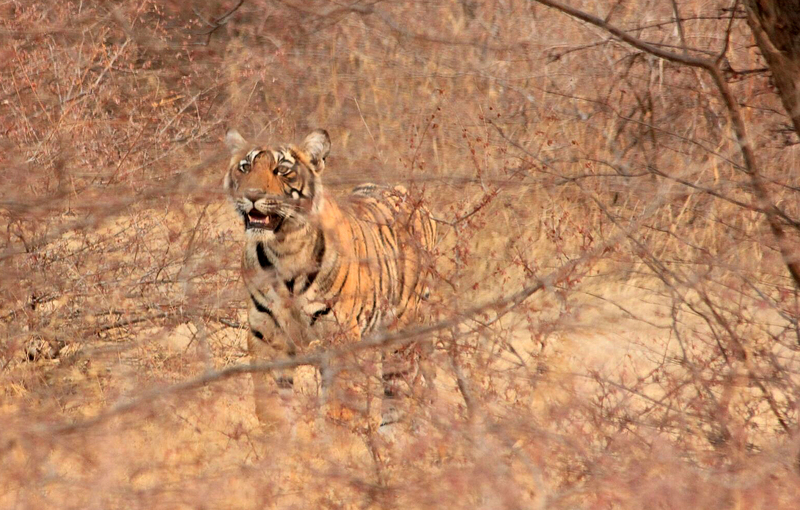 Great success has bought a natural problem to the fore – the problem of tiger territory. The tigers are pushing out because of territorial issues with each other into villages, farms and settlements. We were staying at the Tiger Den which is just 10 minutes drive from the main town of Rathambore. Tigers and leopards are seen on many occasions by the staff who finish their shift at 10.30pm sitting on walls or in trees or simply climbing over the 8 foot or so wall of the park and crossing the road towards the village. These predators are simply driven in by the various free roaming cattle and pigs (easy pickings) not the mention dogs which also roam around. These regular visits also unfortunately end in human deaths too. Last month a local lady was killed by a leopard and in 2012 a young boy was killed just off the road by a tiger who he disturbed at 6.30am. Leopards are more likely to stalk a human whilst tigers will only attack if they are provoked. Whilst it is clearly not the big cats fault as nature dictates but those that do kill humans are captured and taken to a zoo, so other human lives are spared. The forestry commission, driven by these incidents foreseen and written about by Hash Vardan many years ago (one of India’s best known and influential wildlife campaigners already mentioned earlier), have decided to take action at last and create a ‘wildlife corridor’ known as the Keladevi wildlife corridor within in the next six years. This will add a much needed additional area to the existing National Park, making the whole area over 1000 sq kms whilst creating more safari routes in time – a solution for the next decade hopefully. The Indian government wheels turn slowly but better late than never. Karizanga National Park, In the state of Assam North East India. As we endeavor to be a little different with our itineraries at Wildfoot Travel, we try to offer something interestingly unique. We have flown from Delhi to Guwarte the major city on Assam and a similar distance you would from London to Rome. Karazanga National Park is too unique to miss out. I took an extension to this interesting, diverse region covering the some of the worlds important grasslands and the monsoon flood area of the Brahmaputra River. The rivers is one of the world’s longest waterways and one of the most important to the environment and surrounding natural world. Karizanga National Park. Worth an extended visit. This park overseas another large game animal namely two thirds of the endemic one horned rhinoceros. Whilst this poor animal is poached for a particular Chinese meditational reasons, thankfully numbers are increasing despite a huge 48 loss to poachers in 2014. In the last two years the Indian government have pulled out the stops with 24/7 park guards shooting to kill anyone who will risk the lives for a peace of horn for what most people know to be of no medicinal use whatsoever. But the risk is always there especially as the Chinese border is only a few hours away. A guard and loaded gun is always sent out with each jeep, apparently for our safety and to protect from potential attacks as well as for general security of the park. This region holds the highest population of tigers in the world but because of the rich vegetation there is very little chance of seeing one. Birding does however offer another great opportunity with over 250 species. Over the last two days we have seen over 50 without looking too hard. Another guest at the hotel we were staying at was lucky enough to see a tiger today, fleetingly but a sighting all the same. 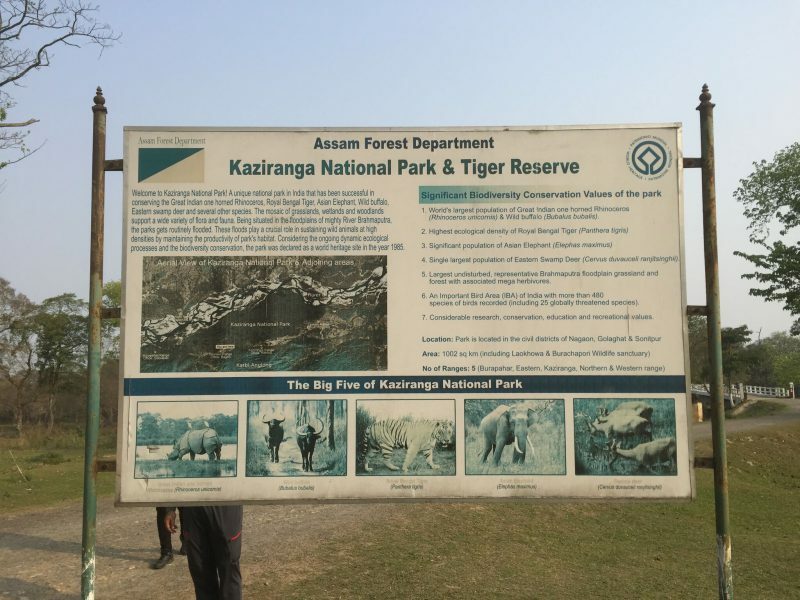 Karizanga National Park is closed for 5 or 6 months of the year because of monsoon and the massive expansion of the Brahmaputra River which takes over any lowlands it may. Unfortunately, this is a time when a small amount of Rhinos are drowned but its considered natural wastage by the government and they don’t seem to be able to do much about this even though the rhinos are of great endemic importance. As Karizanga Park is off the beaten track – a three hour flight from Delhi plus a further five hours from Guwarte airport. It would make your trip more worthwhile if you held a strong interest in general wildlife and birding. Unless you hold a dedicated interest in the one horned rhino there may be other parks and regions you can reach with less travel time. This is not to say I would dissuade you from visiting Assam and beyond as there is lots more to eastern India and you could combine with Bhutan easily, which opens up even more extensive possibilities.